Three-year-old Cole Petersen holding one of Moline’s newly legal chickens. If you think about the type of person likely to raise backyard chickens in the Quad Cities, you might conjure a vision of somebody similar to Liz Smith. With philosophical and practical motivations and a love of animals, she did her research and educated her city’s leaders. The kids are clearly excited to feed the chickens mealworm treats, and they handle the animals more like pets than agriculture. But she conceded she didn’t know how much work it entailed – and wasn’t ready for the dozens of eggs she got each week when the hens she bought started producing at about six months. That’s one thing you should consider if the prospects of plentiful eggs and cute birds get you excited: Chickens are fast and they do fly. They also get old. From spring through fall of their three or four peak production years, hens will average almost an egg per day. But backyard chickens commonly live eight to 10 years, with some living twice that long. Smith, Schmidt Urban, and Ramsey-Moody are part of the urban-chicken movement in the Quad Cities, all working for change within their respective municipalities. They have each collected signatures for petitions, but their approaches and motivations are all a little different. Schmidt Urban is working with her neighbor Mike Angelos on the petition drive in Davenport, and they’re pushing for less regulation than you’ll see in other cities.“Too many regulations defeated the purpose,” Angelos said. “Our [suggested] ordinance, we tried to be less restrictive.” Part of this, they admitted, is selfish, because they hope to share a coop somewhere on their contiguous properties near NorthPark Mall. “A program just needs to get started ... and then as complaints come in, they tighten up the ordinance,” Schmidt Urban said. Davenport city staff has been directed to study the issue of urban hens, and Angelos said he’s hopeful the council will pass an ordinance later this year. Other common restrictions include that chickens can be used only for noncommercial purposes; that licensees must take a class on raising chickens; and that neighbors must be notified if somebody intends to apply for a chicken license. Those components were all present in the amendment considered by the Rock Island City Council in August – although it would not have forbidden the selling of eggs. Rock Island’s proposed ordinance limited the number of hens to six for properties 10,000 square feet (roughly 23 percent of an acre) or less, and to 10 for larger properties. Austin and the two other council members who voted “no” cited concerns about smell. When I visited Smith’s house, I noticed no odor – but I also had a cold. However, even cursory reading on the topic suggests that proper maintenance of coops can make them inoffensive to the noses of neighbors. And Moline’s ordinance addresses the issue simply and directly: “Odors from hens, hen manure, or other hen-related substances shall not be perceptible beyond the boundaries of the licensed premises.” The failed Rock Island amendment had a similar requirement. The issue of urban chickens is expected to be brought before the Rock Island City Council again in slightly different form. Smith, who started the Moline petition drive herself and eventually began working with Mary Petersen on it, said it’s important to start small with city councils – as a way to alleviate concerns, unfounded or not. “We went in there kind of low-balling it, because we would rather them say ‘yes’ to a lower amount [of hens] than ‘no’ just in general,” Smith said. “Get it in, start somewhere,” Petersen said. “We haven’t really talked about what we would want in the end,” she added, but she and Smith agreed that 10 hens would be a reasonable limit in Moline. “If, in a couple years, there are no issues, then maybe we’ll ask to revisit it,” Smith said. 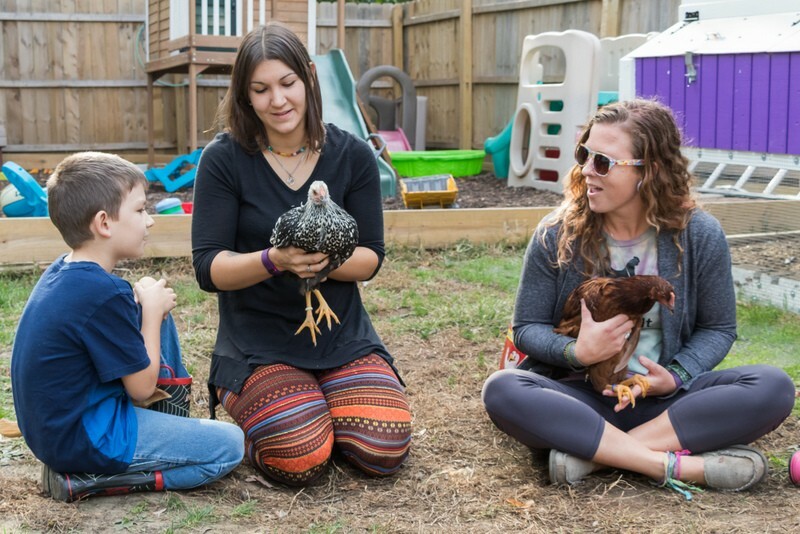 The idea of raising chickens in cities might seem weird to some people, but in many ways the local prohibitions against it are the odd thing – particularly in an area that’s so heavily agricultural. • Urban hens fit nicely with the concept of homesteading, which has a long tradition in the United States. • Schmidt Urban noted that Americans were urged to create and maintain “victory gardens” – including keeping chickens – during World War I and World War II. • Contemporary urban homesteading stands as a response to the industrialized nature of our country’s food-production and -distribution systems, and in particular how poultry is farmed. It gives families some control over their food supply in the face of concerns about factory farms. Many backyard-chicken advocates also note that nearly all of the United States’ largest 100 cities allow urban hens – including Atlanta, Boston, Chicago, Dallas, Houston, Los Angeles, Miami, New York, Philadelphia, Phoenix, San Antonio, San Diego, San Francisco, and Seattle. “We have all these large towns that somehow can handle it, can figure it out,” Schmidt Urban said. As strange as it seems that chickens are allowed in New York City but not Davenport, Iowa, that difference actually makes a little sense. For one thing, the sprawling human congestion of our largest cities highlights the need for agricultural oases within. But if you need a taste of country in the Midwest, all you need to do is drive for 10 or so minutes. As Schmidt Urban said, “People around here never think they have to go back to the land, because the go-back-to-the-land thing is right outside of town.” We don’t have the heightened need for urban agriculture because rural agricultural is just down the road. Ramsey-Moody said that after the August vote by the Rock Island City Council, she got a letter saying she’s in violation of the law, but she also said she’s been told by city officials that any action against her has been deferred until the council makes a final decision on urban chickens. As of press time Tuesday, four Rock Island officials had not responded to an October 7 e-mail requesting confirmation that existing chicken owners are, at least temporarily, being given a pass. People interviewed for this article said that fears that the Quad Cities will be overrun by hens if cities allow urban chickens are unwarranted. 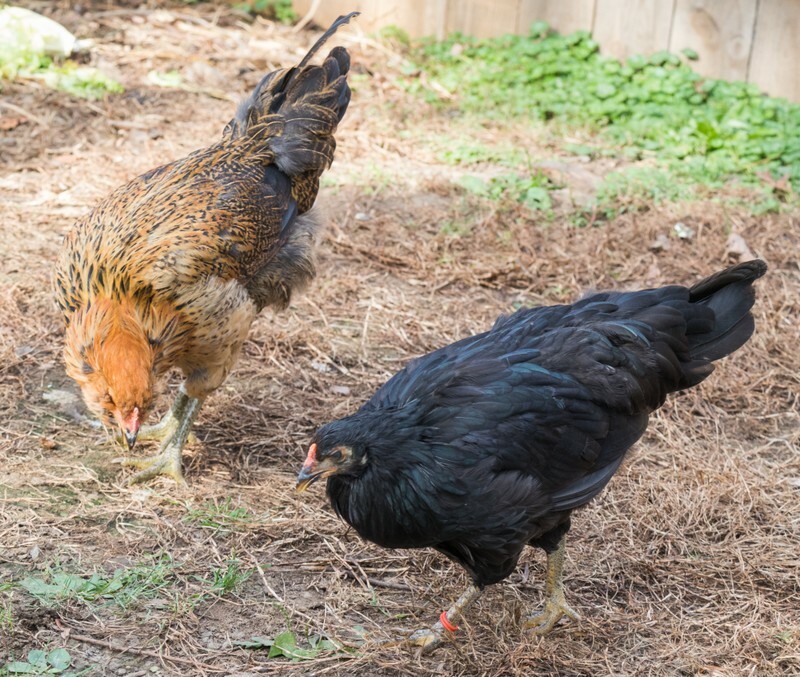 Residents such as Ramsey-Moody already have birds – city code be damned – and keeping chickens is simply not something that a large number of people want to do. Moline’s urban-chicken licensing began August 1, and as of September 26, only 10 licenses had been applied for and issued, said Keith Verbeke, the city’s finance manager. “The first thing is they’re going to have money in order to get the whole thing set up,” Schmidt Urban said. The birds might only cost a few dollars apiece, but then there’s the coop and other equipment. Several people interviewed for this article said an inexpensive coop still costs more than $100. Smith said she spent $1,200 on her coop, and she additionally installed a solar-powered door that opens at sunrise and closes at sunset. “It’s an investment,” she said. “I don’t plan on having this for just a year or two. Their lifespan is about five or six years,” and she wanted a coop that would last.